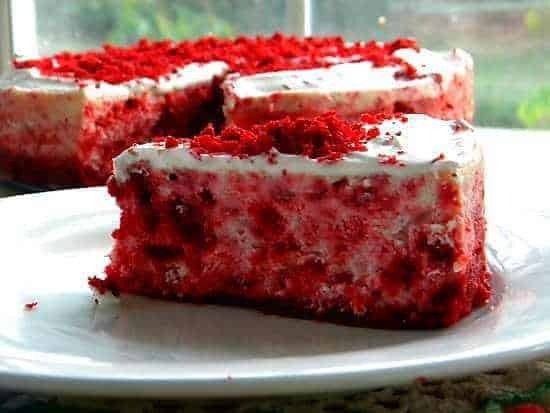 Unique homemade red velvet cheesecake recipe is absolutely the best! 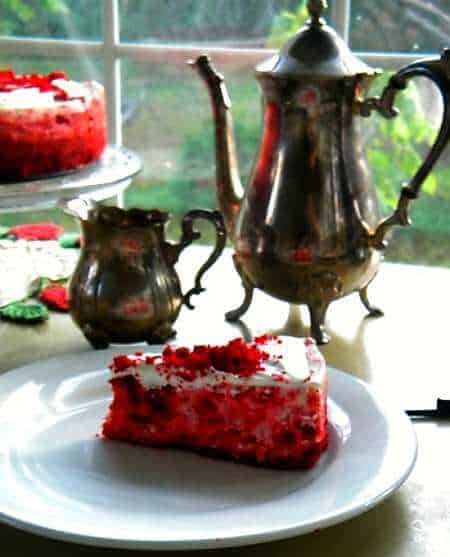 It’s made with a New York Style cheesecake batter swirled with tender pieces of crimson red velvet cake – beautiful, delicious, and totally different from anything you’ve had before. This cheesecake is SO easy to make and even easier if you take a couple of days to do the steps. In fact, you could use a red velvet cake from a bakery if you were really short on time. This recipe was originally published in June 2011. My son is home for the first time in three years. He is in the Air Force, stationed in Northern Japan, and it is difficult for him to get leave time. A lot has changed in past three years for both of us. So, as a result…as I told my Facebook readers… I won’t be online as much, nor will I post as much. Do you blame me? One of Chris’s favorite desserts is Red Velvet Cake. I wanted to make him something special to welcome him home…and I think I succeeded. I made a cheesecake. A red velvet one. I had seen a lot of Red Velvet Cheesecakes that were based on the cake but I wanted pieces of the cake to be nestled in a rich, creamy cheesecake batter. I wanted it to be cheesecake with pieces of cake randomly in it, and I think I succeeded. It comes out creamy and rich with a nice textural contrast from the cake pieces. Chris loved it, the whole family loved it…and I think you will, too. Updating this post brought back so many wonderful memories. Today that son and the gorgeous wife he married in 2013 are expecting their first baby in December. I can’t wait for my 4th grandchild to make his or her appearance! He has been with the Thunderbirds for the last couple of years so I’ve gotten to see him a LOT more often than when he was in Japan!! He’ll be getting a new assignment in 2017 but I’m hoping it won’t take them too far away. Of course, I am praying what ever is best for his family because that’s what moms do, right? 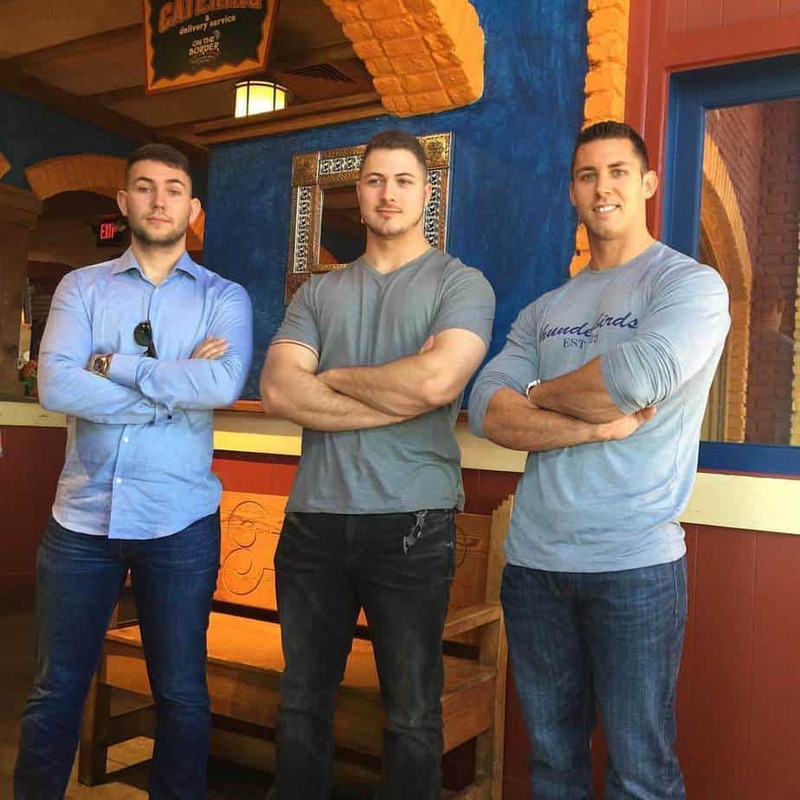 My three military sons! The one at the front (Thunderbirds shirt) is the one this cheesecake was created for. I used my favorite Red Velvet cake recipe for the cake and my foundation cheesecake recipe for the rest. I used a thin layer of the batter to line the springform pan and baked it in the oven right along with the rest of the red velvet cake batter. Keep an eye on it though – it gets done much sooner! You can bake the rest of the batter in any size pan that’s convenient because you are going to break it up anyway. 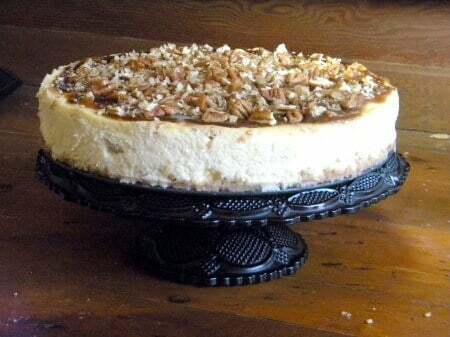 The cheesecake itself is a rich vanilla, classic New York cheesecake. While it bakes the pieces of cake sort of soak up some of the cheesecake flavor. 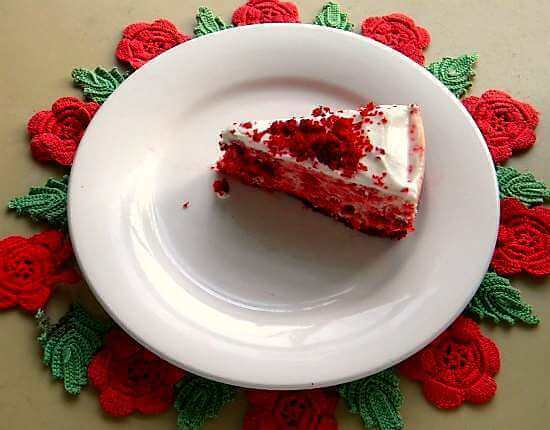 An added plus was that the red velvet cake helped break up the richness of the creamy cheesecake. It was nothing short of fantabulous. Fantabulous is totally a word. Just before serving top the finished, chilled cake with white chocolate flavored whipped cream and cake crumbles for a little added drama. 🙂 Isn’t it gorgeous? If you have time give yourself three days to make this red velvet creation. Bake the cake on the first day, the cheesecake on the second, and serve it the third day. Get it out of the refrigerator about 1/2 hour before serving for the best texture and flavor. 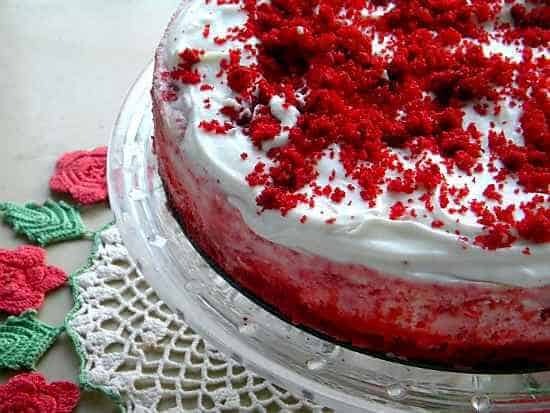 This red velvet cheesecake is just beautiful for Christmas or Valentine’s Day. Or, add some blueberries and serve it on the 4th of July! Be sure and get the crust layer no more than 1/4 inch thick with batter or you will have too much cake on the bottom. Follow all the directions carefully. The water bath is important so don’t skip it. Make sure your aluminum foil is wrapped securely around the bottom of the springform and up the sides to prevent leaking. Do NOT peek at the cheesecake while it is baking or resting because it makes it cranky. Let the cake come to room temperature before chilling. Place paper towel over the top of the cake before wrapping with plastic wrap and chilling. This will keep the top dry and help guard against cracking. The Red Velvet Cake recipe is my favorite. I know you have seen it before. It’s always a gorgeous crimson red – never that ugly brown color I’ve seen on so many red velvet cakes. I did leave out the rosewater in this one. It wouldn’t work with the other flavors. I love cheesecake! It’s so rich and creamy! 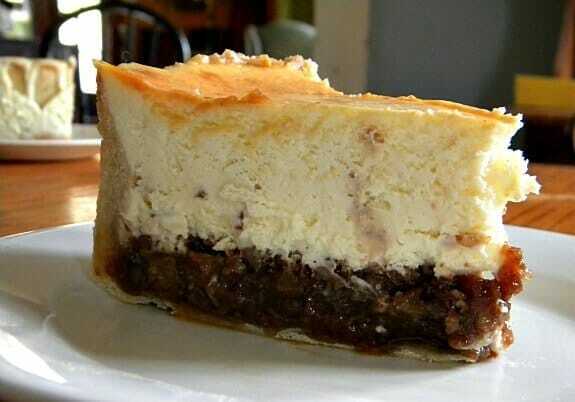 Here are some more great cheesecake recipes from Restless Chipotle. Honestly, this is one of my favorite holiday desserts. It’s so pretty and festive!If you are doing a Christmas dessert buffet consider adding this fruitcake as well. I know – it’s got a bad rep but THIS fruitcake is truly amazing. Sticky and candylike. It’s another holiday classic around here. If you love this recipe please give it 5 stars. 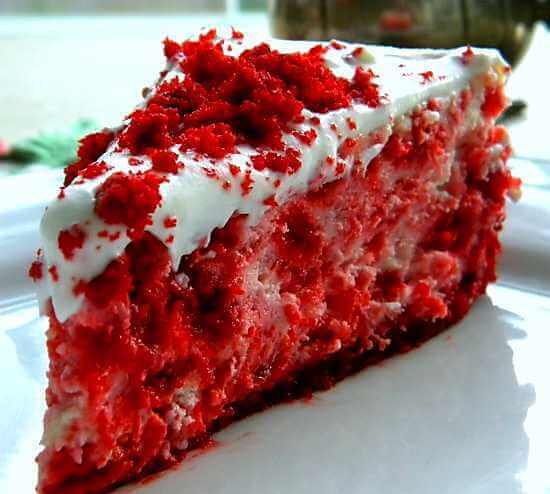 I love red velvet cake and cupcakes, and muffins, but i must admit, i have never had red velvet cheesecake. I have to change that now. Yours looks fantastic!! Aw, thanks Julie! It really is so good. This cake looks so pretty and colorful! great recipe. Um. YES! Just yes. I’m sure your son enjoyed it, and I bet anyone else that managed to get a slice did, too. We’ll definitely be trying this! This looks so decadent and even though this post is older, I can only imagine how overjoyed your son would have been to receive this! What a gorgeous cheesecake. Hope your son is still doing well. So gorgeous and totally festive! What a great idea for Christmas! I like the cake crumbs in the cheesecake idea. Very nice! 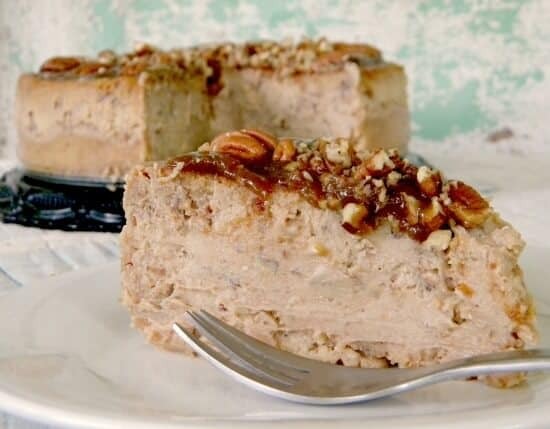 Mary – even though this is an older recipe – I simply have to say it looks amazing! Those pieces of the cake nestled in that rich, creamy cheesecake is making me wanna bust through the screen! This cake is wild! I love the idea of combining two cakes. Although I don’t make red velvet cake (or at least haven’t up til now), it’s such a cool looking dessert – and with cheesecake, it’s a sure winner in my house. Absolutely gorgeous cheesecake Marye. Chris must have loved it. What welcome home!!! You always make such beautiful cakes. I love visiting your blog to see what you’re up to in the kitchen! He did. I believe he has been harassing his wife to make it. The Air Force can be a great life – I grew up in it. Hope your son is still doing well. I bet this is still his favorite. It would be my daughter’s favorite. He is! He an his wife are both with the Thunderbirds now. This beautiful cheesecake is the perfect way to celebrate! It would be a big hit in my house! Thanks Faith! It is probably time I make it again…. I did! 🙂 Thanks for stopping by! Two of my most favorite things! So..am I to understand the aluminum foil goes under the bottom of the RV crusted pan before I pour in the batter then place the entire pan in the hot water bath and then put it in the oven to bake?? How exciting that your son is home! Enjoy every moment! This cake is so pretty – perfect for the holidays. I have made this cake many times over the past year. It is always a hit and it presents itself beautifully. The frosting topping I use is cream cheese, powdered sugar and a little vanilla. The whipped frosting topping is a beautiful touch. Thank you for the recipe. I am so glad! Thanks for letting me know! Oh my heck!! It looks fabulous and has two of my favorite desserts all in one! 🙂 thanks! So glad you stopped by! Love the recipe and your tips! I can taste it in my head – and I know it will taste just as fabulous in my mouth! LOL! Uh.. yeah. This is so good. I can see why it’s his favorite! Unbelievably gorgeous!